So, that’s why they were late to the reception. 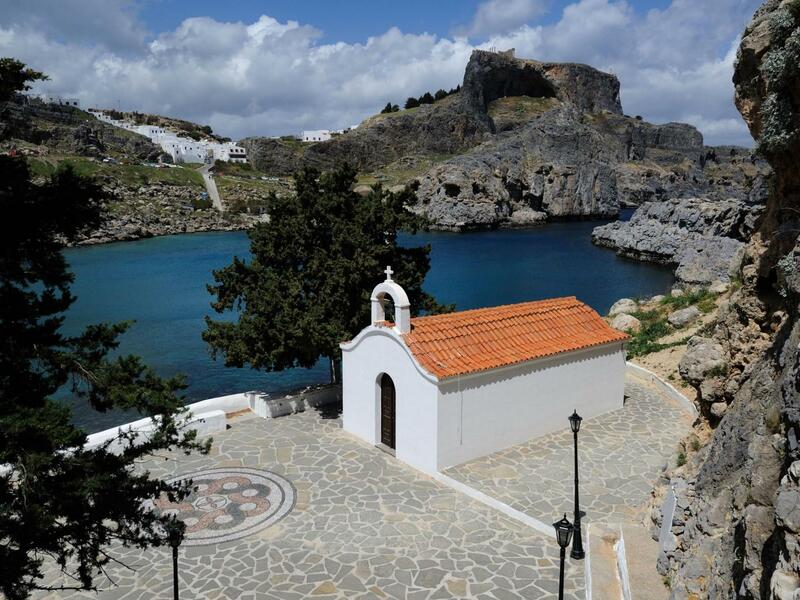 To the surprise of no one (except maybe the bride and groom who caused the uproar), Bishop Kyrillos of Rhodes has issued a ban on all foreigners marrying at St. Paul’s Chapel on the island of Rhodes. The cause? Carly and Matthew Lunn, who were just married at the chapel and took some incredibly inappropriate wedding photos to mark the occasion. Carly, 34, and Matthew, 27, are from Birmingham, England and went to the Greek monastery for their marriage, taking their family with them. After the ceremony, it was time for the traditional photos. The bride and groom smiling, the families gathered around, and… this. How they weren’t struck down by a lightning bolt (by Zeus or God — take your pick) on the spot is a miracle enough to tell you that God is merciful. Matthew’s grandfather said he was “disgusted” by the photo. I’m sure he had more to say privately, but that was his public statement. Maybe he’s the only one in the family who knows the difference between private and public. The photo was taken by a family member, which is somehow even worse than having a professionally paid photographer on site to record this. The only way this could be worse would be if Matthew were throwing up a Nazi salute instead of a simple air-punch. The couple said that the photo had been planned for a while now and when the picture was posted on social media, it went viral. They had expected to get lots of “laughs and jokes from people,” but they didn’t realize their oversharing would be a popular share. They were shocked that even people “back in England” were commenting on it and they said “the whole thing went mad.” No, the situation didn’t go mad, you’re just a terrible decision maker. Brits were furious that their citizens would go overseas and act so disgracefully. One couple had already planned a wedding at the same chapel next spring, but are no longer allowed to hold the ceremony there due to these spoil sports. They might be lucky, because the mayor of Rhodes still has time to make a final decision on whether the ban should be lifted in a few weeks. The man who performed their marriage ceremony said, “Shame on those two for the damage they have done. Would they have done the same in their homeland, in front of a British chapel, a Jewish temple, a Muslim mosque?” Er, one of those things aren’t like the others. Rhodes is a Greek, 541 square mile island, just south of Turkey in the Aegean sea. With just over 50,000 inhabitants, it was once home to one of the Seven Wonders of the Ancient World, the Colossus of Rhodes. After the island was captured by a Muslim caliph in 653, it was melted down and sold.